Notes: Editor's note: This is yet another license that belongs to Geneon, which means you might see it on TV, but there won't be a DVD release until another company picks up the rights for it. This series is a sequel to Magical Girl Lyrical Nanoha. But since I have not seen that series, this review shall be written as a stand-alone. Despite that, the story is rather easy to get into. 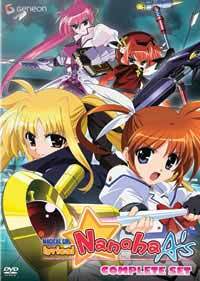 The 2 main characters, Nanoha and Fate Testarossa, must have met and helped each other in the previous anime and will now work together again to defeat the Book of Darkness under the guidance of the Time-Space Administration Bureau. The story moves along quite fast to quickly reintroduce characters. The addition, as far as I can tell is the new "baddie" in the form of Yagami Hayate that is needed to move the story as the owner of the Book of Darkness. But we all know Hayate-chan simply cannot be one of the "bad guys" because of anime rule number I-lost-count; there can be no evil being in the mahou-shoujo category. They are simply forced by circumstances. There is not much to complain for a typical mahou-shoujo series. This series full of eye-candy, complete with super-kawaii characters, seifuku, gratuitous transformation scenes, bright colours and design and surprisingly good and clean fight sequences. I love the way the magic staffs are able to load cartridges and shape shift into different forms, and how the unique, magical pattern will appear when they are preparing to cast a big spell. And the final show-down is not too disappointing either. But if there are something out of the ordinary with this series, it's the chemistry between Nanoha and Fate. Although it is very explicit in that letters are exchange and how they always think about each other, their friendship and bond cannot be "felt" when you see the two of them on-screen together. On the other hand, the bond between Hayate-chan and her Velda Knights is almost tangible. In fact, they provided the story with the warmer and comical moments; in the way that Hayate-chan have never mistreated them and always try to look after them in her own way as she thinks befits a "Master". Perhaps it is the way the story is written to enable the viewers to see the quiet moments that Hayate-chan share with her Knights. As far as casting is concern, those characters on the "evil" side put up a stronger performance. But this is not totally unexpected as they have a higher level of angst, motive and conviction. There should not be any bones to pick about the happy-ever-after ending. You didn't think Nanoha and Fate is really going to kill Hayate-chan, do you? Recommended Audience: Preferably mature audience; younger audience will need parental supervision. The characters are still very human, they get hurt and injured.